Ho Lee (left), Mi Saito and Hyojin Yoo (right) were arrested Friday, March 24, 2017 at the Pine Tree Spa. 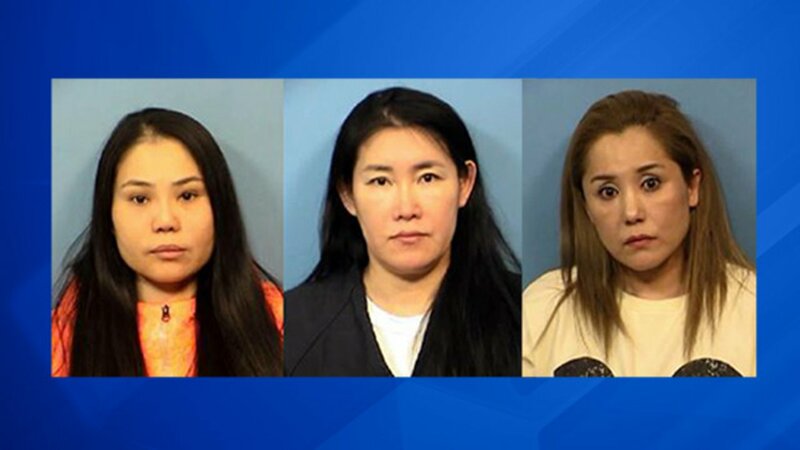 WILLOWBROOK, Ill. (WLS) -- Three women were arrested in Willowbrook, Ill., on Friday after an undercover investigation at a spa, according to the DuPage County Sherriff's Office. Ho Lee, 37, was arrested for prostitution and unlicensed massage therapy, according to police. Police said Mi Saito, 50, and Hyojin Yoo, 44, were also arrested for unlicensed massage therapy. The three were arrested at the Pine Tree Spa at 10 S. 648 Route 83 in Willowbrook. Four women were arrested at the spa in May 2016 on similar charges after the Sheriff's Office received a complaint.